Lisa Worley has provided information on her Davis family who lived near Bronaugh. Rudolphus and Rutha Jane Davis...taken before January, 1924, but not for sure when. Rudolphus Davis was a son of Thomas and Lucinda (Seacat) Davis. In the History of Vernon County, Missouri, by CF Cooper (1911) we learn that the Davis family moved to Clark County, MO in 1856. Rudolphus was born June 14, 1834 in Harrison County, IN. He married Rutha Jane Stevens (daughter of Col. RS Crandall Stevens) on Aug. 16, 1855 in Harrison County, IN. 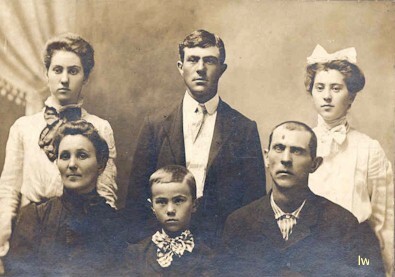 Their children are as follows: James Monroe (who married Laura Ann Funk), Josephine Marilla (who married John Marion Kendell), Ada C. (b:1862 and d:1887), Stewart (married Nora Etta Whiteside), Wilford Hazen (b:1868 and d:1872), and Oliver Otto (b:1872 and d:1873). Rudolphus enlisted as a Corporal with the Union for the Civil War, in IN, on Dec. 2,1861. He was with Company F, 59th Infantry Regiment IN. He reenlisted in the same company and regiment on Jan. 1, 1864. He mustered out Jul. 17, 1865 in Louisville, KY. The battles he was involved in were: New Madrid, MO; Corinth, Monolia Hill, Raymond, Jackson, Mississippi, Champion Hill, Mission Ridge, and Siege of Vicksburg; finally at Huntsville, Alabama with Gen. Sherman in the march to the sea. 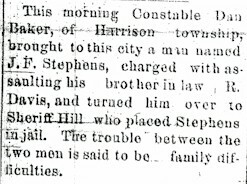 He returned to Harrison County, IN, Sept. 6, 1865 and moved his family one year later (1866) to Vernon County, MO, settling on section 3, Harrison Township. Later buying 120 acres making 200 acres in all. Above - Davis Cemetery graves of Rudolphus and Rutha J. Davis. Above: Ada Davis - 1862 - 1887. Daughter of Rudolphus and Rutha Davis. Davis Cemetery. The family cemetery referred to is Stevens Cemetery which has also been called Davis Cemetery. It is in Harrison Townhip about 5 miles northwest of Bronaugh. Perhaps it is called Stevens because there is another Davis Cemetery in Vernon County. 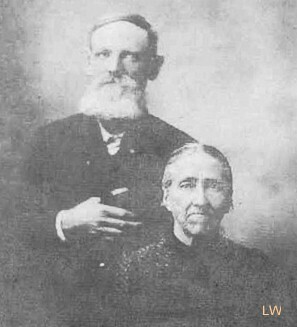 left: Rutha J. Davis' parents are also buried in the Davis/Stevens Cemetery - Crandall and Chinselsa Stevens. Above, Robert Stevens, son of Crandall and Chinselsa Stevens. Died June 10, 1877, age 22. 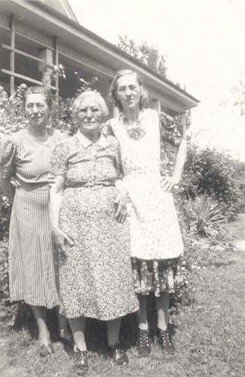 Above: Laura Ann Funk Davis (center), with her 2 daughters, Arra Worsley & Ora Davis...., Ora is the taller one. standing: Ora, Earl, and Arra Belle Davis. Laura Ann was daughter of Laban and Susan Whitworth Funk. All of them are all buried at Worsley Cemetery Earl, Berl (Beryl) and Arra next to their parents and Arra with her husband, Boyd Worsley. The obituary for Rudolphus was in the June 15, 1927, Bronaugh Journal. Here is the obituary for a William Stevens from the January 7, 1908 Nevada Daily Mail. 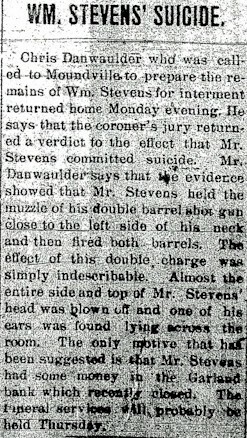 The description of the suicide of Mr. Stevens is about as graphic as one can imagine! I do not have proof that he is related to the other Stevens' on this page. 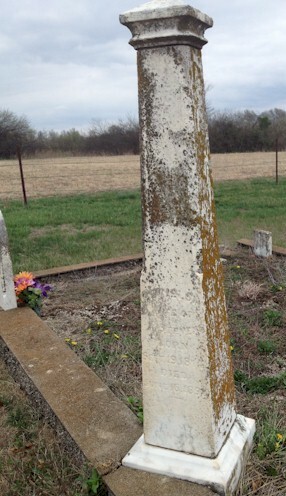 William Stevens is buried at Welborn Cemetery. His dates are June 16, 1844 - January 6, 1908. His wife, Catherine Lamb Stevens is buried beside him with dates of November 30, 1849 - August 17, 1919. If you have Davis information to share or questions please email Lisa Worley. Go back to Bronaugh or Moundville. Background Music- American Beauty Rag.